ImageUrl The URL for the image shown next to the node. NodeSpacing The space (in pixels) between the current node and the node above and below. The space (in pixels) between the top and bottom of the node text and border around the text. HorizontalPadding The space (in pixels) between the left and right of the node text and border around the text. 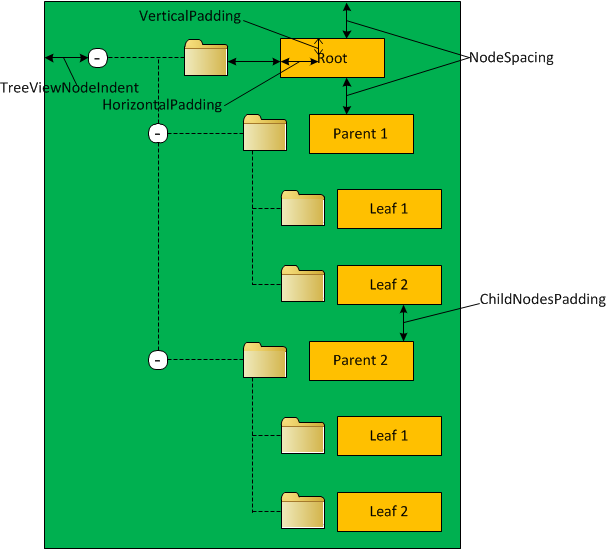 The space (in pixels) between the last child node of an expanded parent node and the following sibling node. 1. Turn off the node lines in a tree using the TreeView.ShowExpandCollapse property. 2. Set the collapsed and expanded indicators of the TreeView (usually represented by plus and minus icons) using the CollapseImageUrl and ExpandImageUrl properties. 3. Set what’s displayed next to nodes that have no children using the NoExpandImageUrl property. 4. Show check boxes next to every node setting the TreeView.ShowCheckBoxes property to true. 5. Show check boxes next to individual nodes setting the TreeNode.ShowCheckBox property to true. 6. Determine if a given node is checked by examining the TreeNode.Checked property.